This CXR Mavic Ultimate rear wheel delivers total supremacy as regards aerodynamics & performance. With the 80mm deep section rim, tubular design & the WTS, it provides everything you need to go fast during your Criterium, TT or Tri event. The Mavic CXR Ultimate wheels feature an outstanding full carbon rim profile of 80mm. The rims feature their CX01 wheel technology which delivers an integrated Wheel-Tyre-System that smooths air flow around the tubs and wheel and improves laminar air flow at every yaw angle. The perfect choice if wanting total aerodynamic supremacy against your competitors or just wanting to go as fast as possible. These CXR Ultimate wheels offer exceptional aerodynamics and performance which is due to the advanced technology used in their manufacture. 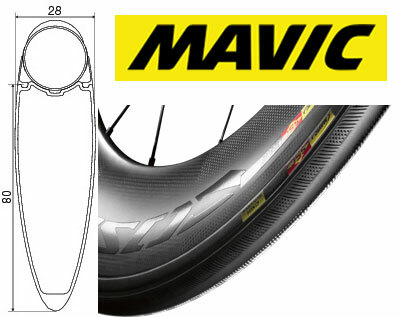 When low drag makes a difference, Mavic's HyperAero WTS bring you up front. The WTS line features the most advanced technologies and perfectly integrates wheel and tyre together to deliver the lowest drag ever.